Billed as “Ancient Egypt/Modern L.A.’s Ultimate Action Hero”, Robert Roach’s Menthu is just that, serving as the same kind of blend of superhero action and legendary mythos as the likes of Marvel’s Thor or DC’s Wonder Woman. In this case, as the label indicates, the lore of Ancient Egypt takes center stage as the central figure- Rashan N’Shanga aka Menthu- is the powerful son of the Kemetic god of war Anhur. 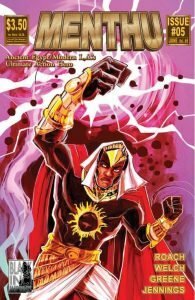 Beyond that, Menthu is a relatively straight forward “classic” superhero book with this two-issue arc focusing on a battle between Menthu and the villainous Haitian rogue Trouble Man. Harkening back to it’s “classic” feel, the two issues complete a full story- while it helps to have read the preceding comics where Menthu is obviously introduced. On the other end there are hints dropped as to things to come, and there is a clear beginning and end to the self-contained tale. This is a welcome relief from the more decompressed nature of modern superhero comics. Creator Roach’s art is big, bold and vibrant; tailor made for this type of larger than life book. While a bit too cartoonish in certain instances, it is nevertheless on the whole clear and distinctive with solid pacing and storytelling. While the dialogue is a bit off putting at times primarily due to some of the representations of accents, it is on the whole solid and not something I would consider a negative. The same generally could be said for the lettering as well- a bit too stylish and over the top for my taste in spots. Especially with some of the effect choices, I would not say it’s out and out something to hold against the book. There’s obvious skill displayed and done well enough, it’s just a bit over the top for me. There are no complaints about the coloring though, it is well done and gives the book a very clean look as it compliments the artwork very nicely. My review copy of issue #6 was not fully finished, so the cover and some of the colors were not quite finished. Issue #5 though features a gorgeous John Jennings exclusive cover. I’m sure issue #6’s cover will be just as splendid. All in all Menthu was enjoyable and the exact kind of book the comic book industry needs, showcasing an original black superhero that puts a more accurate face on Egyptian mythology and lore (the gods in Menthu’s world look nothing like King Leonidas or Jaimie Lannister). Make sure to check it out if you get a chance!